setTimeout executes a function after a given number of milliseconds and setInterval executes a function forever at a given interval. You can read more about them here (setTimeout and setInterval). Most developers use them, but don’t really understand what is going on behind the scenes. An interesting explanation came from John Resig’s blog. I originally took the information as fact without doing my own investigation. About a year ago AppNexus decided to give an interview question on setInterval. My colleague, Sam Mati, and I decided to do some tests on setInterval. Interestingly, we found John’s model of setInterval to be wrong. Here is the important diagram from John’s blog post. 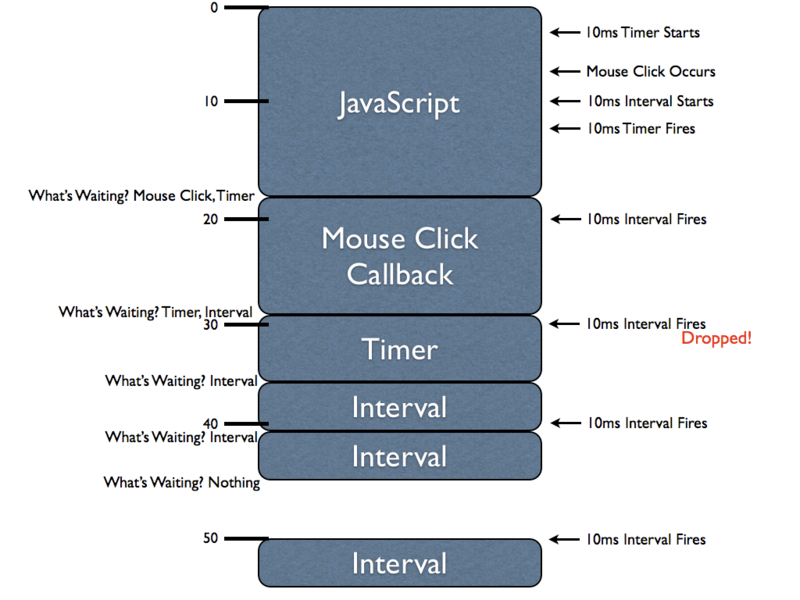 Notice that setInterval’s function is always placed on the event stack at 10ms intervals from the original execution time. If another event takes too much time, only one setInterval function will remain in the queue at a time. We decided to create a simple test. The code executes a setInterval at a 1 second interval and then has code that runs for 1.5 seconds. If John’s explanation was correct, we should see something like this. The first setInterval would take 1.5 seconds (because of the slow code), the second would take .5 seconds to get back in sync (with the original call) and then after it would continue at 1s intervals. Here are the results. It has the same result.